The reason I called the first period Pre-History in my original post dividing pen history into eras, was that most histories with names begin after this time. Before 1800, we have hints, rumors and names out of the mists of legend that have come down with not much evidence, and not much more than names, rough dates and maybe a place. The stories that were written later in the 19th-century tell us that right around 1800 there is Thomas Sheldon, or perhaps it was a blacksmith from Sedgley called Daniel Fellows. Of course the French have Arnoux in the 1750’s whose invention was pretty well ignored in France but was stolen by the perfidious British and used for their own enrichment. We do know that Sheldon was making pens in the early 1800’s. 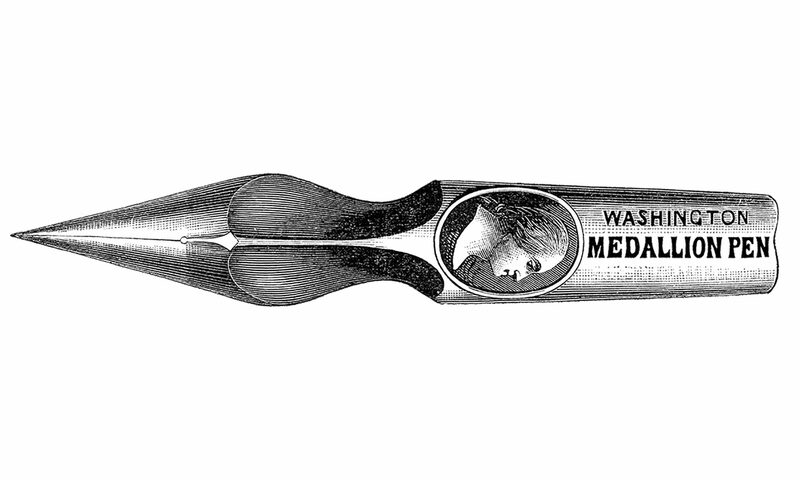 So was Wise, and Donkin, who had the first patent for a metallic pen in Britain in 1808. I have also dealt with Peregrine Williamson in America in a prior post. All of them were active in the 1800’s and some, like Wise kept working up through the ‘teens and into the 1820’s. So far, many of these names come down to us through later stories and anecdotes. It’s rare to find something more substantial, especially anything from the 18th-century. I’d like to add one more name to this list of early makers of metallic pens. I recently came across the names of E. and T. Williams, working in London in 1790. E. and T. Williams, No. 13, Strand, return their grateful thanks to the Nobility, Gentry, and the Public, who have approved and patronized their curious new invented Elastic Pens: respectfully inform them, that they have now, by great care and industry, brought them to the highest perfection; which, for finished workmanship, exactness of moulding, and extraordinary temperature, for durability, as infinitely to surpass every thing of the kind ever introduced in this kingdom. They are fitted into ivory handles, plain, or inlaid, with a gold, silver, and steel Pen to each, or separate, with a pencil. – The steel points are preferred, and jetted over, which prevents their getting rusty. This is a valuable discovery, and a circumstance that has been long and universally complained of in the late ingenious Mr. Pinchbeck’s Steel Pens. PORTABLE FOUNTAIN PENS, of the same quality, warranted to stand the test; the construction and finishing, being so compact and complete, as never can fail of answering the intended purposes, as proved by repeated trials. I don’t have access to a lot of information on London at that time, so I have no more details of the interesting E. and T. Williams. E. and T. Williams are advertising improved articles that are already familiar to the buying public, both their advantages and their problems. I did find in an 1808 city directory of London that there was an E. Williams, Bookseller and Stationer, at 11 Strand. Could be the same. Otherwise, this is what I’ve got. This and a series of ads following that include the phrase, “gold, silver and steel pens” being sold by other stationers and book makers, implying that perhaps they are selling Williams pens, or others have started to imitate them. Here’s one from 1796. Again we see that to start a history of steel pens with Wise in 1803, let alone to start with Perry, Gillott and Mitchell in the 1820’s, is missing a “pre-history” that was real nonetheless. Rarely do these inventions just spring complete and original from the mind of a genius. This is the favored narrative in the 19th and for much of the 20th-century; the Great Man (because it’s always a man) theory of discovery and innovation. The reality is that there’s almost always some foundations laid by others, early models and patterns upon which are drawn the inspirations for later developments. Oh, and I need not mention the October 14, 1895 Harrisburg Daily panegyric for the recently deceased Richard Esterbrook (who started Esterbrook in 1860) that claimed for him the title of “the inventor of the steel pen”, is, shall we say, a bit off the mark.